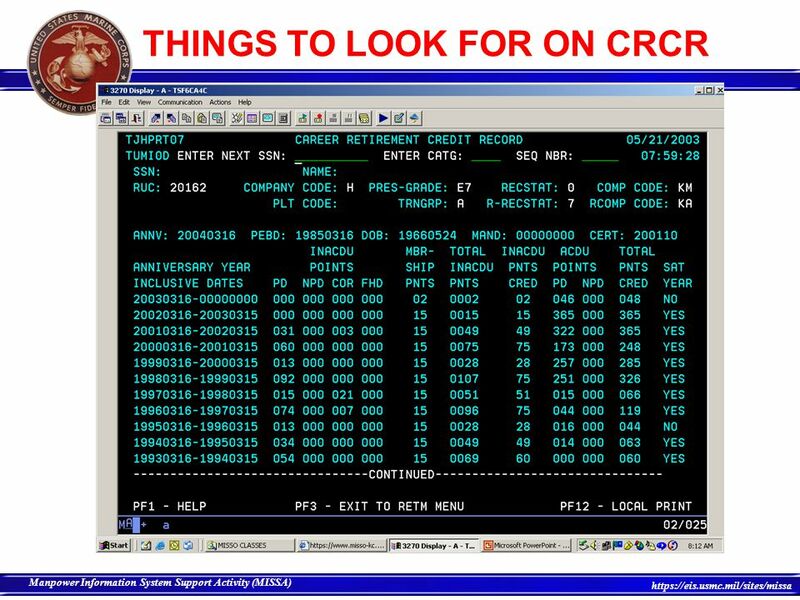 2 What is a CRCR? 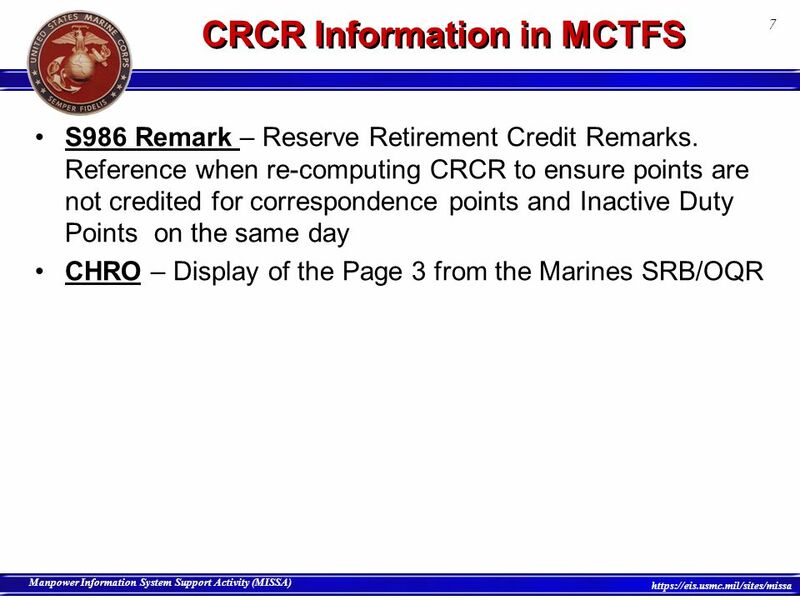 The CRCR is used to establish the years of Federal Service for a Marine Reservist. 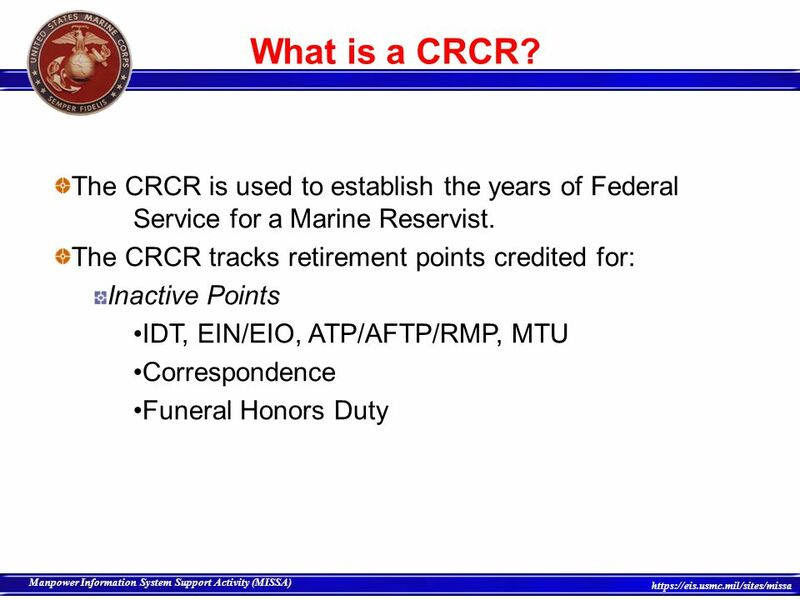 The CRCR tracks retirement points credited for: Inactive Points IDT, EIN/EIO, ATP/AFTP/RMP, MTU Correspondence Funeral Honors Duty Three elements: 1. Principle of non-competition 2. Valued Assistance: from the standpoint of the recipient, “What does the Transitioning Marine see as valuable?” 3. Mutually supportive life-long relationship First assumptions in the Concept of Operations are: That “retention of quality Marines in the Active Component will remain our top priority.” 2. That all reasonable retention efforts are exhausted before a Marine leaves active service. 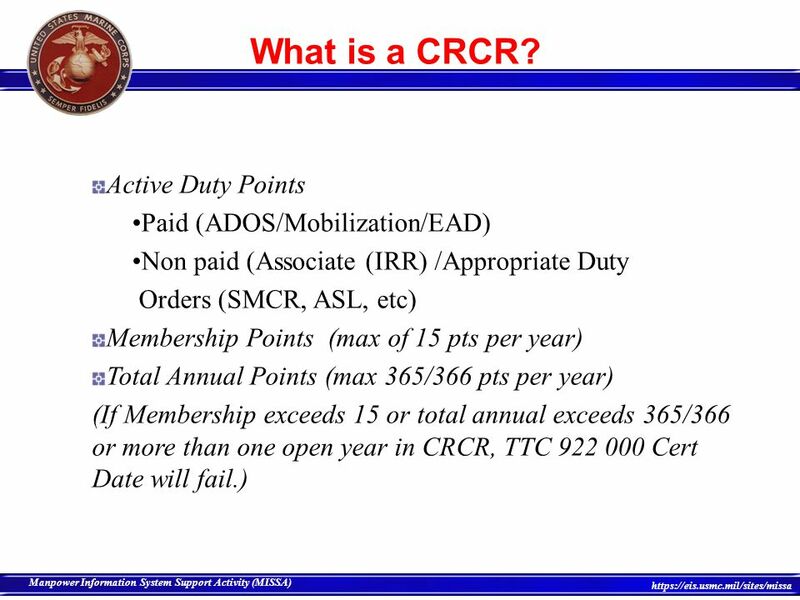 Non paid (Associate (IRR) /Appropriate Duty Orders (SMCR, ASL, etc) Membership Points (max of 15 pts per year) Total Annual Points (max 365/366 pts per year) (If Membership exceeds 15 or total annual exceeds 365/366 or more than one open year in CRCR, TTC Cert Date will fail.) Three elements: 1. Principle of non-competition 2. Valued Assistance: from the standpoint of the recipient, “What does the Transitioning Marine see as valuable?” 3. Mutually supportive life-long relationship First assumptions in the Concept of Operations are: That “retention of quality Marines in the Active Component will remain our top priority.” 2. That all reasonable retention efforts are exhausted before a Marine leaves active service. 11 What is a Satisfactory Year? 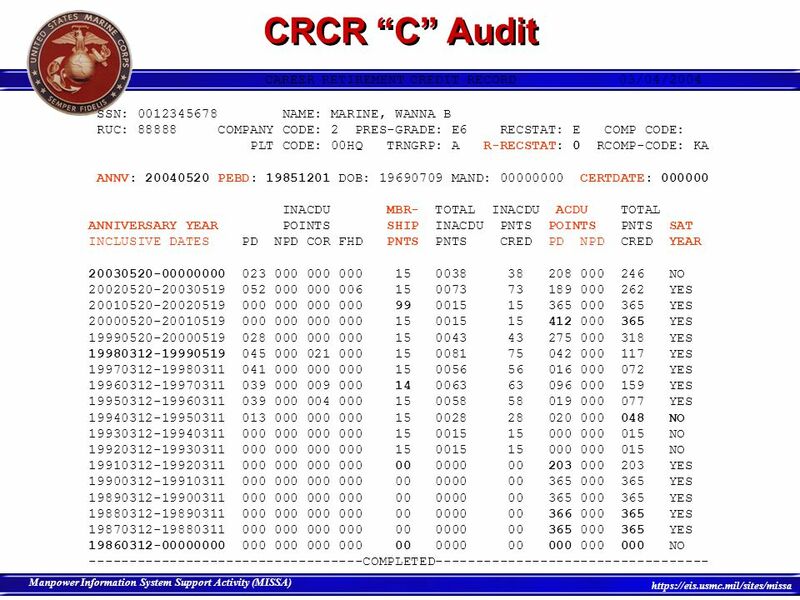 12 CRCR “C” Audit 1) Verify the CertDate, should be current yr or previous yr. 2) Verify the ResRecStat - what is the Marine’s ‘status’ . 3) Verify the PEBD - it should never be prior to the earliest Anniverary Yr listed (broken time will require PEBD adjustment). 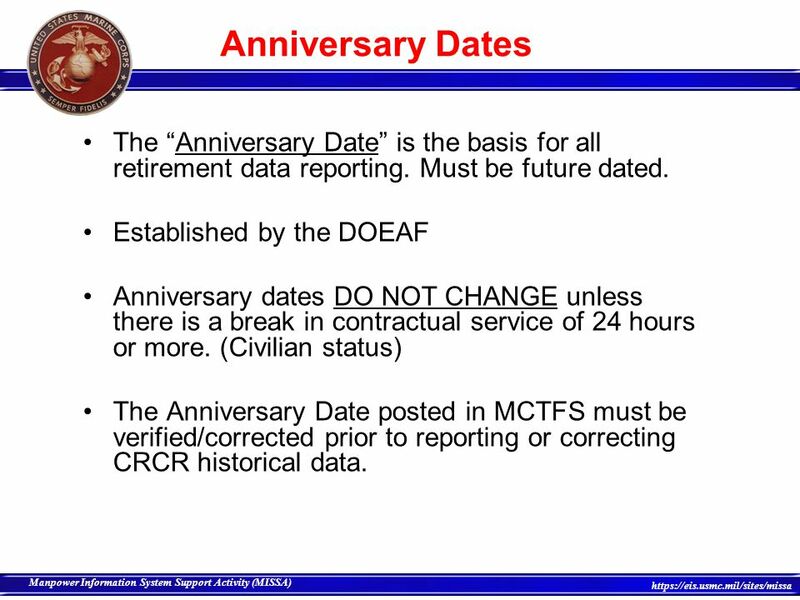 4) Verify the Anniversary Date, it should be exactly 1 yr future dated from latest Anniversary Year open. 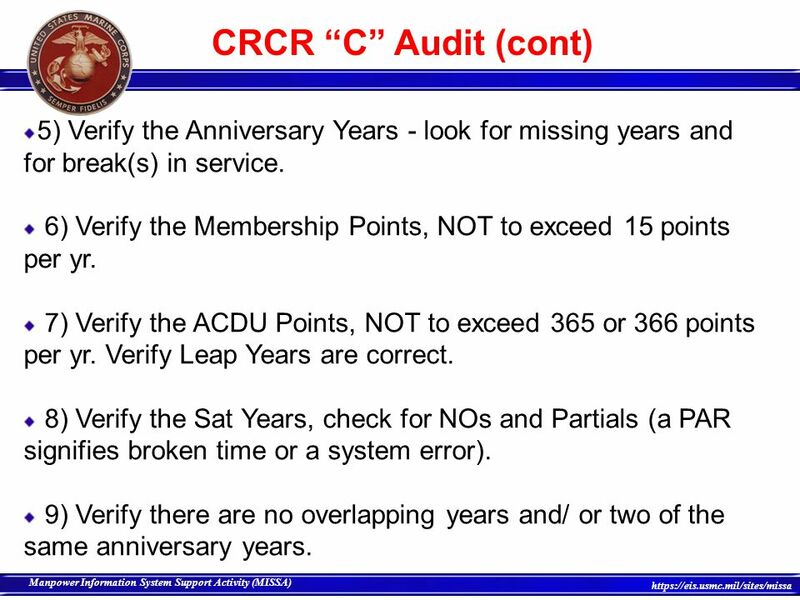 13 CRCR “C” Audit (cont) 5) Verify the Anniversary Years - look for missing years and for break(s) in service. 6) Verify the Membership Points, NOT to exceed 15 points per yr. 7) Verify the ACDU Points, NOT to exceed 365 or 366 points per yr. Verify Leap Years are correct. 8) Verify the Sat Years, check for NOs and Partials (a PAR signifies broken time or a system error). 9) Verify there are no overlapping years and/ or two of the same anniversary years. 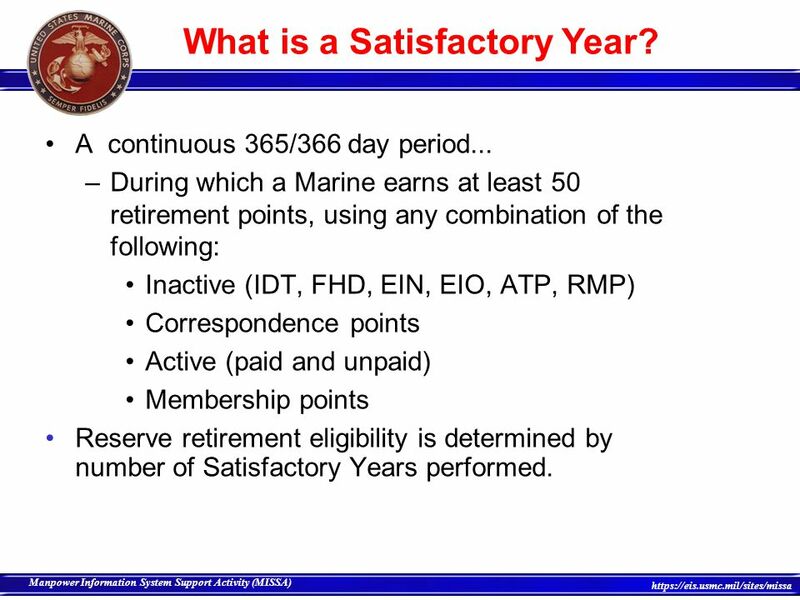 The Marine’s next Anniversary date is: CURRENT anniversary year should be: The PRIOR anniversary year was: Retirement points accrued on or before are considered HISTORICAL DATA. 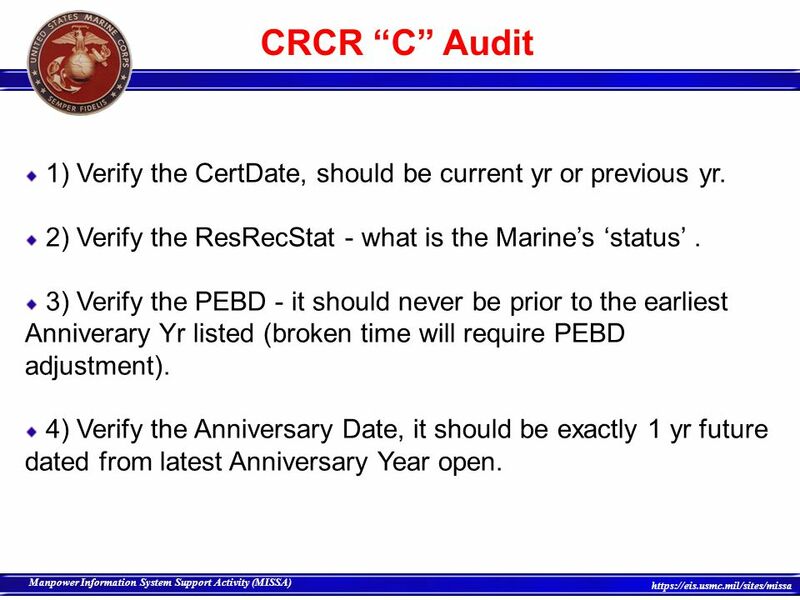 All missing years require a CRCR Worksheet for correction. 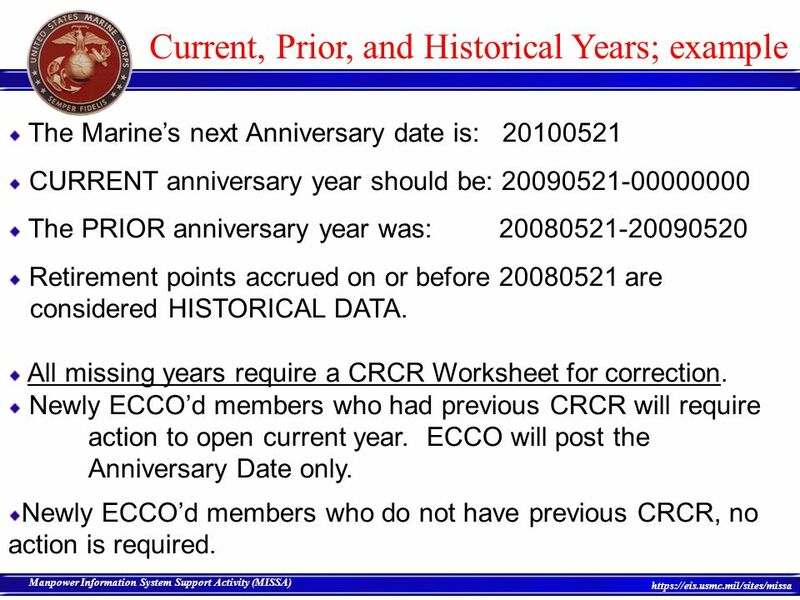 Newly ECCO’d members who had previous CRCR will require action to open current year. ECCO will post the Anniversary Date only. Newly ECCO’d members who do not have previous CRCR, no action is required. The RUC will verify any suspected or identified discrepancies against documents on file (i.e., copies of DD Form 4, extensions, and DD Form 214). 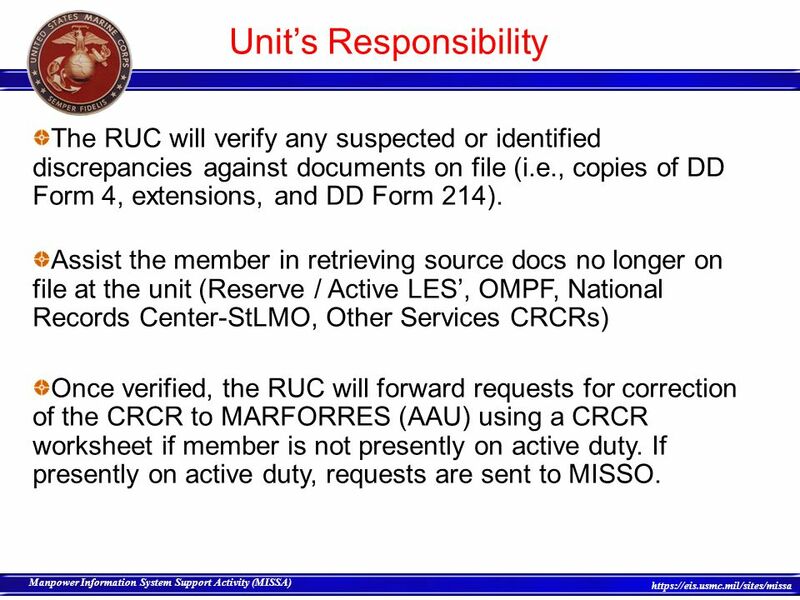 Assist the member in retrieving source docs no longer on file at the unit (Reserve / Active LES’, OMPF, National Records Center-StLMO, Other Services CRCRs) Once verified, the RUC will forward requests for correction of the CRCR to MARFORRES (AAU) using a CRCR worksheet if member is not presently on active duty. If presently on active duty, requests are sent to MISSO. Phase I - Train Hometown links in the selected cities. Hometown links gather organize data in preparation. Identify potential Marines transitioning to the selected cities. Phase II - Initiate contact between transitioning Marines and the Hometown links in the selected cities via phone and/or . Contacted initiated by TR at TAMP. Phase III – Facsimile Website used to facilitate contact and provide information with regards to the selected cities. Should functionally work the same as the full blown system, but limited scope, hardware, and bandwidth. This website will have to be scaled and more data added for full implementation. Six month dry run. 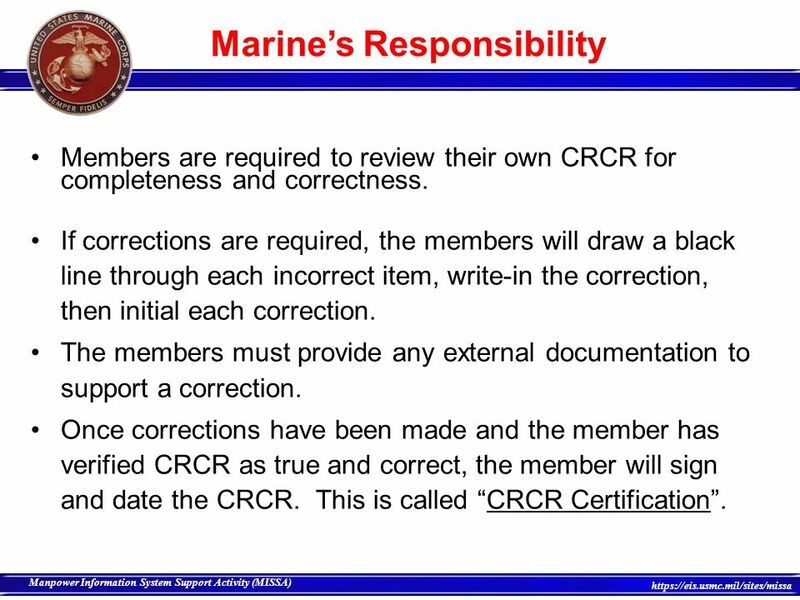 Once all requested/required corrections are completed, a new CRCR will be provided to the member for “CRCR Certification”. 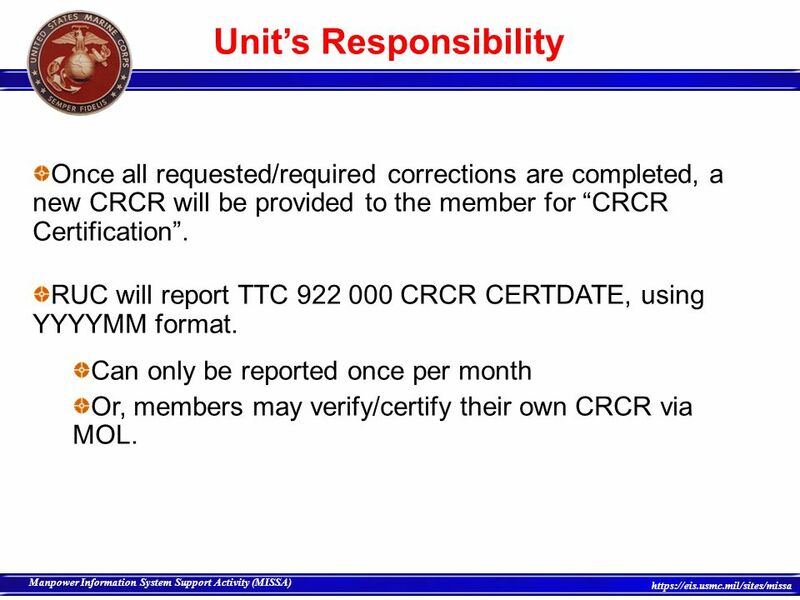 RUC will report TTC CRCR CERTDATE, using YYYYMM format. 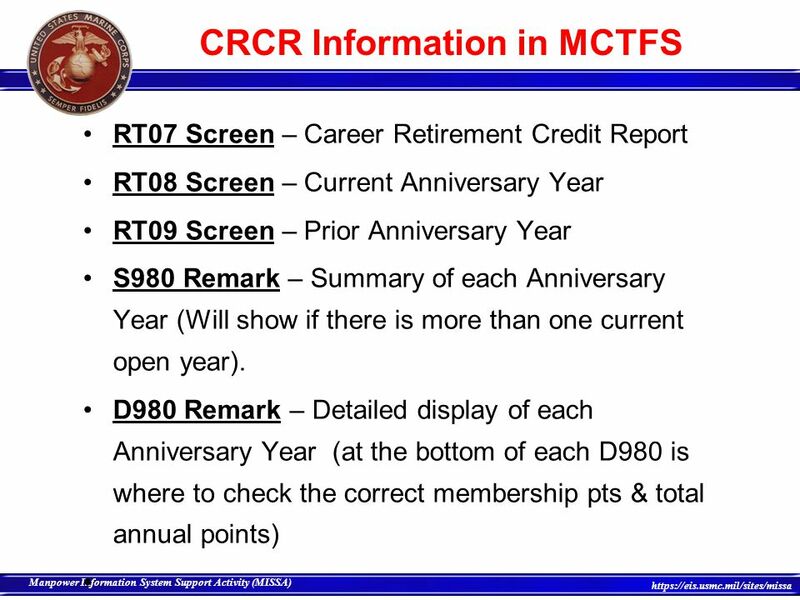 Can only be reported once per month Or, members may verify/certify their own CRCR via MOL. Phase I - Train Hometown links in the selected cities. Hometown links gather organize data in preparation. Identify potential Marines transitioning to the selected cities. Phase II - Initiate contact between transitioning Marines and the Hometown links in the selected cities via phone and/or . Contacted initiated by TR at TAMP. Phase III – Facsimile Website used to facilitate contact and provide information with regards to the selected cities. Should functionally work the same as the full blown system, but limited scope, hardware, and bandwidth. This website will have to be scaled and more data added for full implementation. Six month dry run. 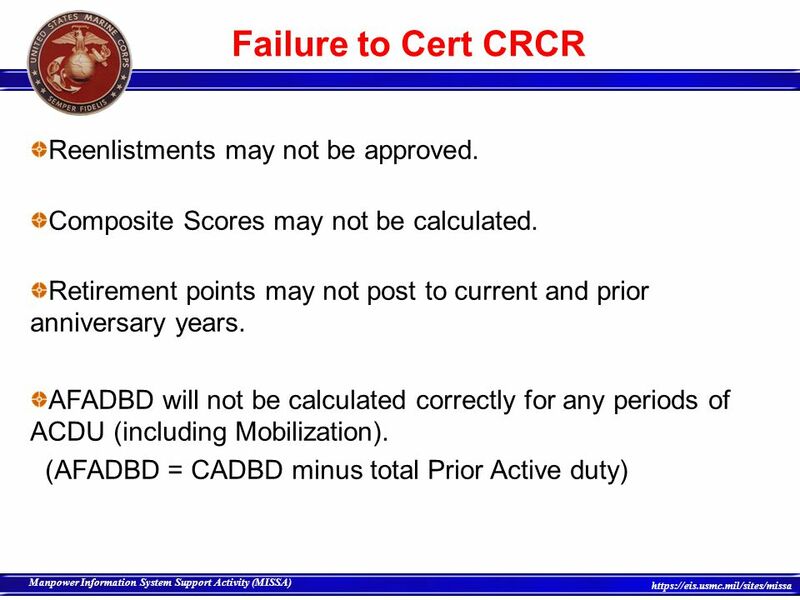 20 Failure to Cert CRCR Reenlistments may not be approved. 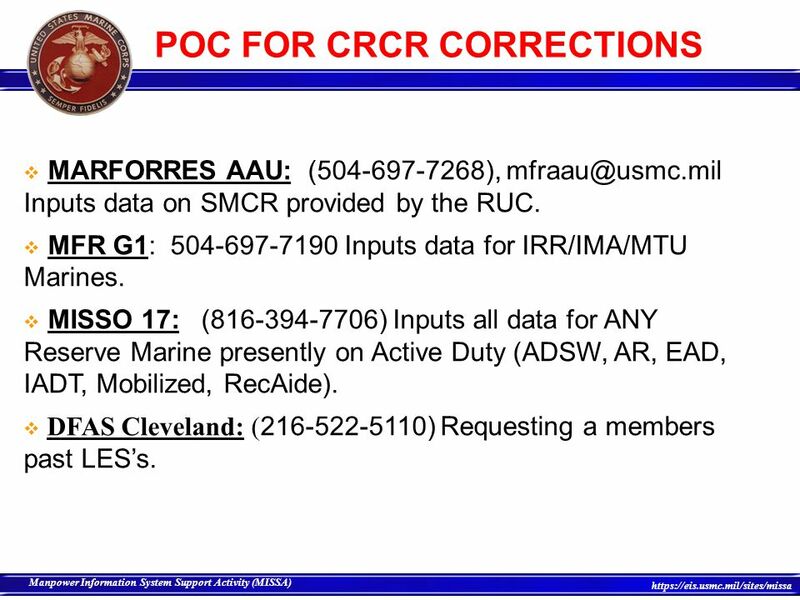 CRCR Reporting: RUC completes worksheet and forwards to MARFORRES AAU or MISSO. 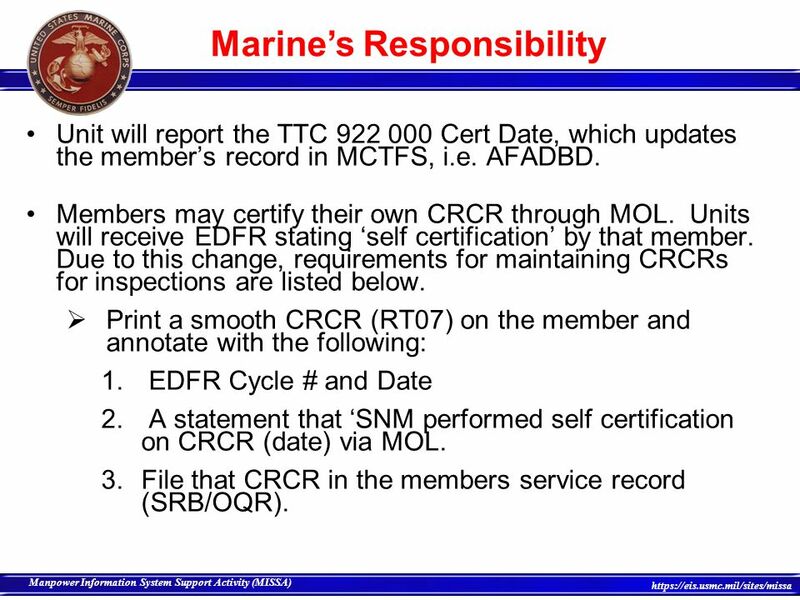 MARFORRES AAU inputs data for SMCR Marines not presently on active duty. 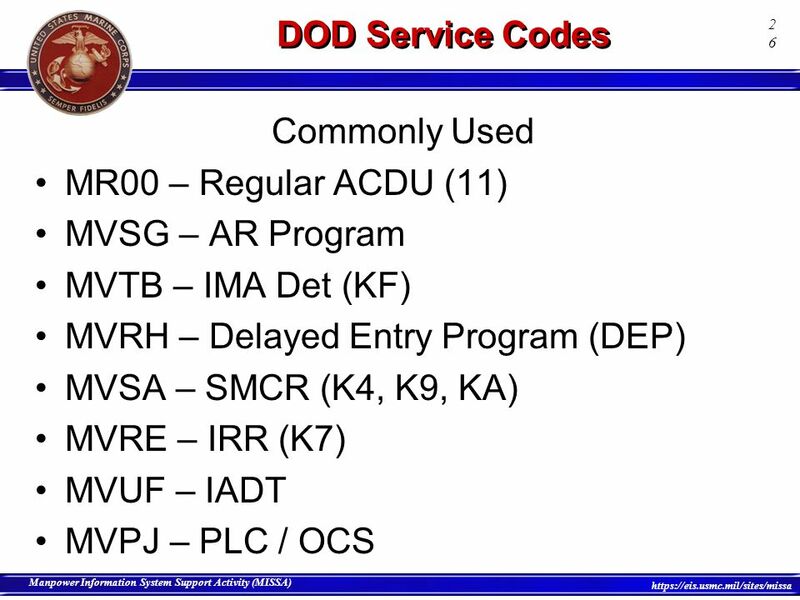 IPAC MFR inputs data for IRR/IMA/MTU Marines. 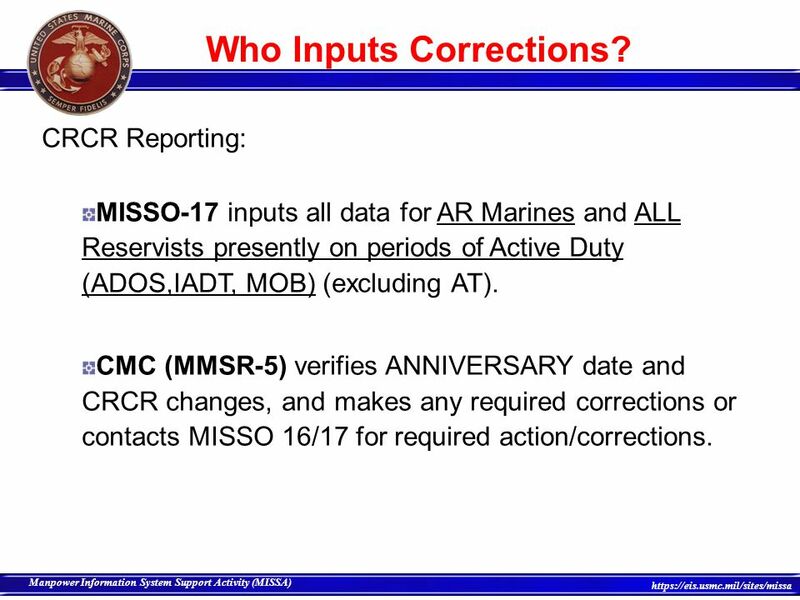 CRCR Reporting: MISSO-17 inputs all data for AR Marines and ALL Reservists presently on periods of Active Duty (ADOS,IADT, MOB) (excluding AT). 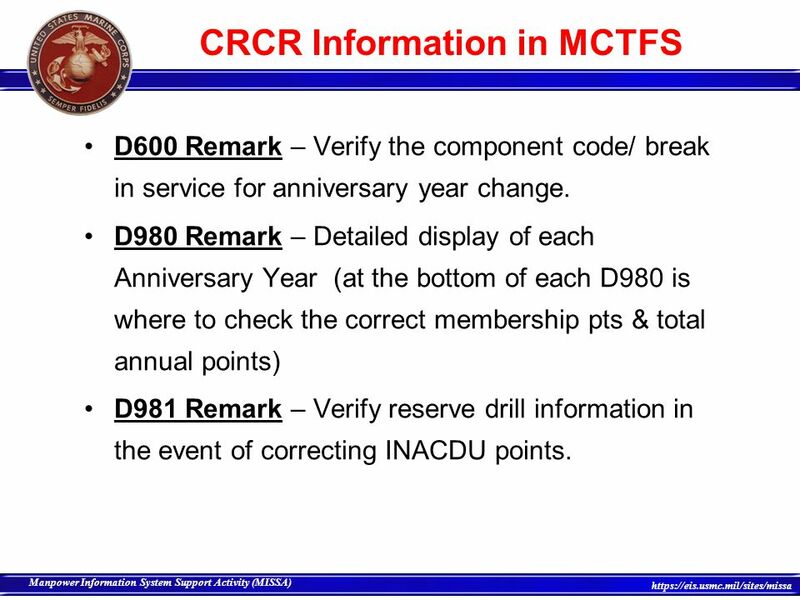 CMC (MMSR-5) verifies ANNIVERSARY date and CRCR changes, and makes any required corrections or contacts MISSO 16/17 for required action/corrections. 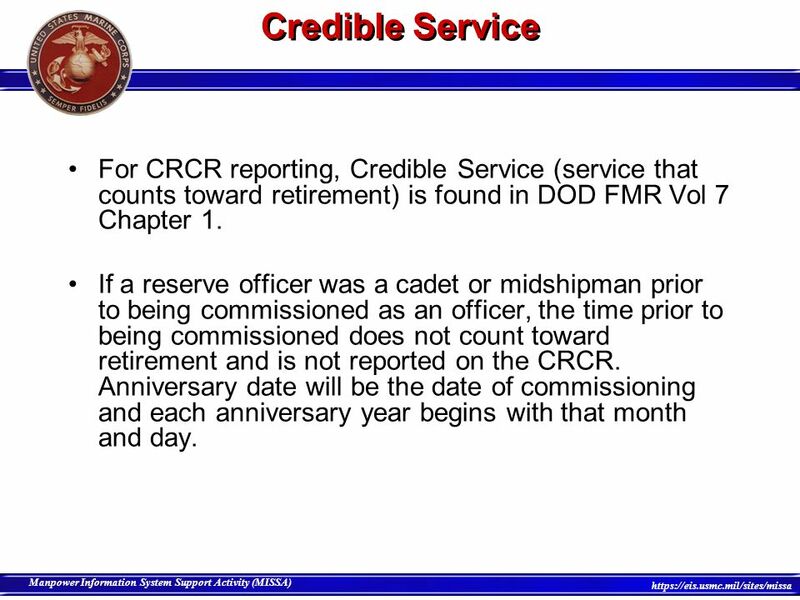 24 Credible Service For CRCR reporting, Credible Service (service that counts toward retirement) is found in DOD FMR Vol 7 Chapter 1. 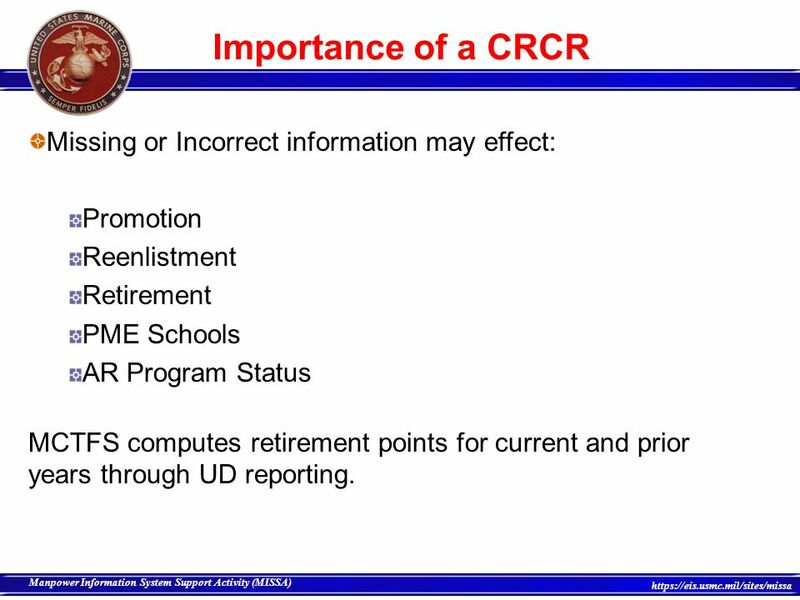 If a reserve officer was a cadet or midshipman prior to being commissioned as an officer, the time prior to being commissioned does not count toward retirement and is not reported on the CRCR. Anniversary date will be the date of commissioning and each anniversary year begins with that month and day. 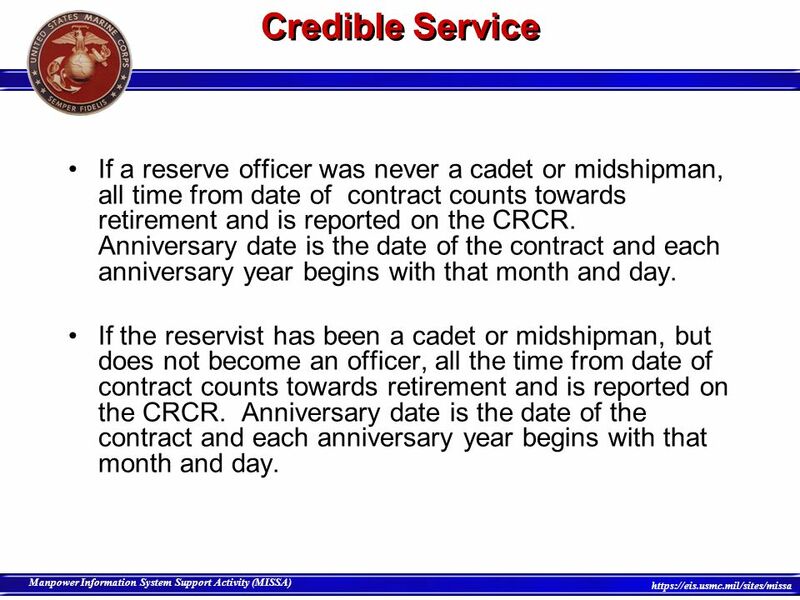 25 Credible Service If a reserve officer was never a cadet or midshipman, all time from date of contract counts towards retirement and is reported on the CRCR. Anniversary date is the date of the contract and each anniversary year begins with that month and day. 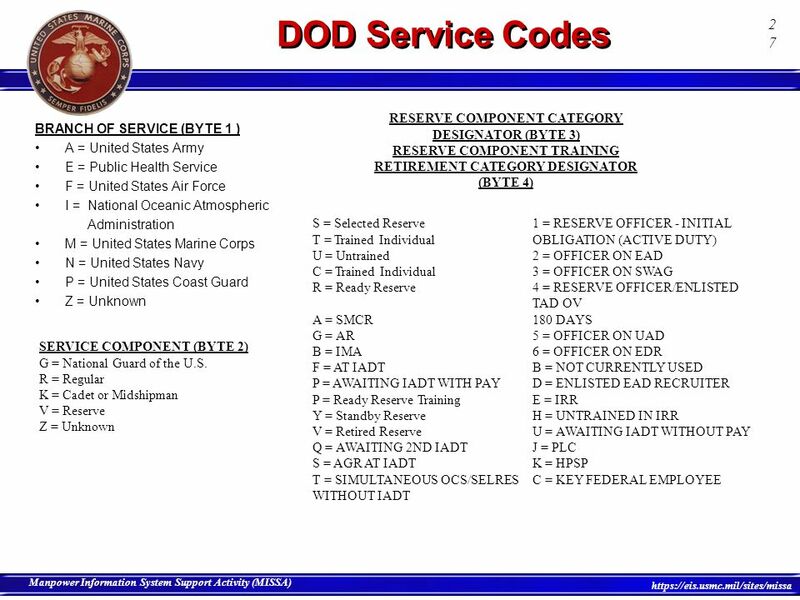 If the reservist has been a cadet or midshipman, but does not become an officer, all the time from date of contract counts towards retirement and is reported on the CRCR. Anniversary date is the date of the contract and each anniversary year begins with that month and day. 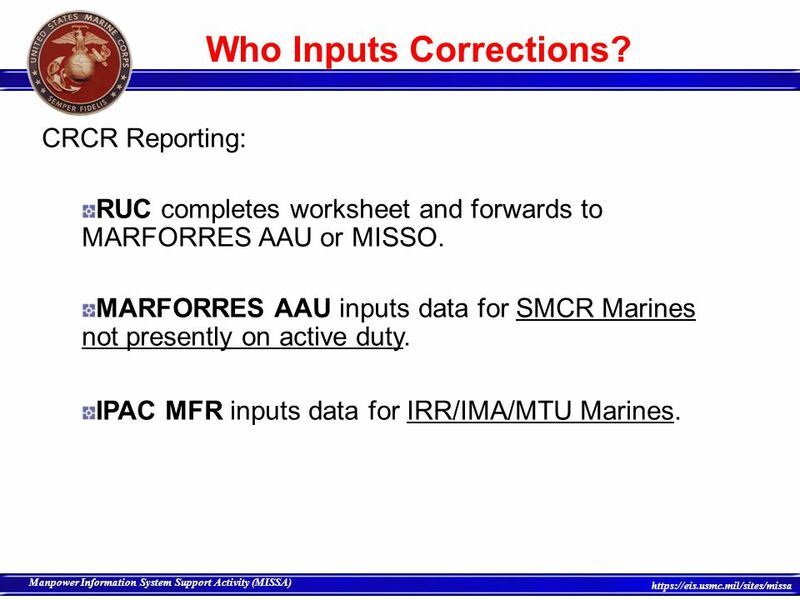 MARFORRES AAU: ( ), Inputs data on SMCR provided by the RUC. 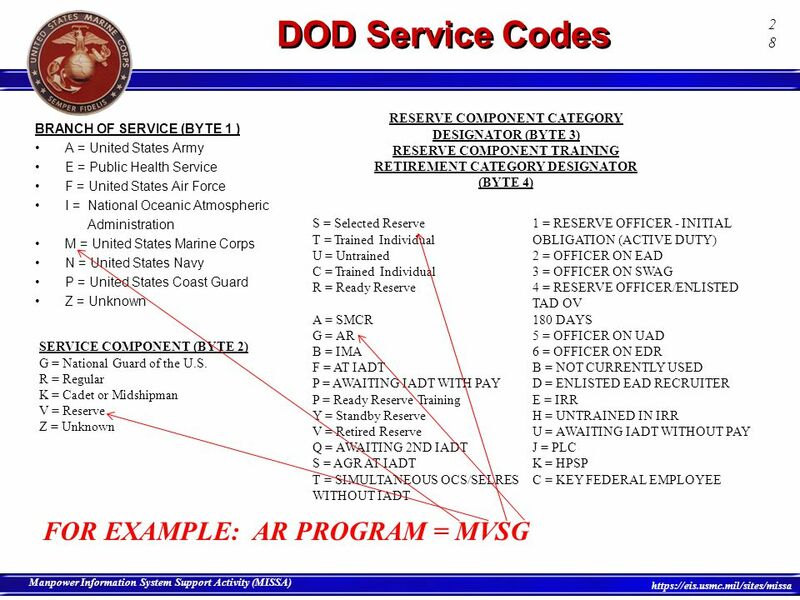 MFR G1: Inputs data for IRR/IMA/MTU Marines. 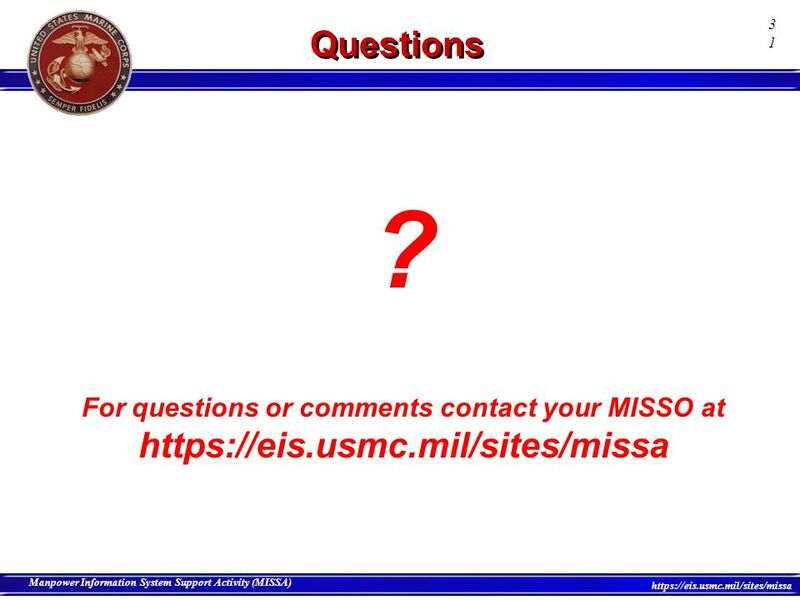 MISSO 17: ( ) Inputs all data for ANY Reserve Marine presently on Active Duty (ADSW, AR, EAD, IADT, Mobilized, RecAide). DFAS Cleveland: ( ) Requesting a members past LES’s. 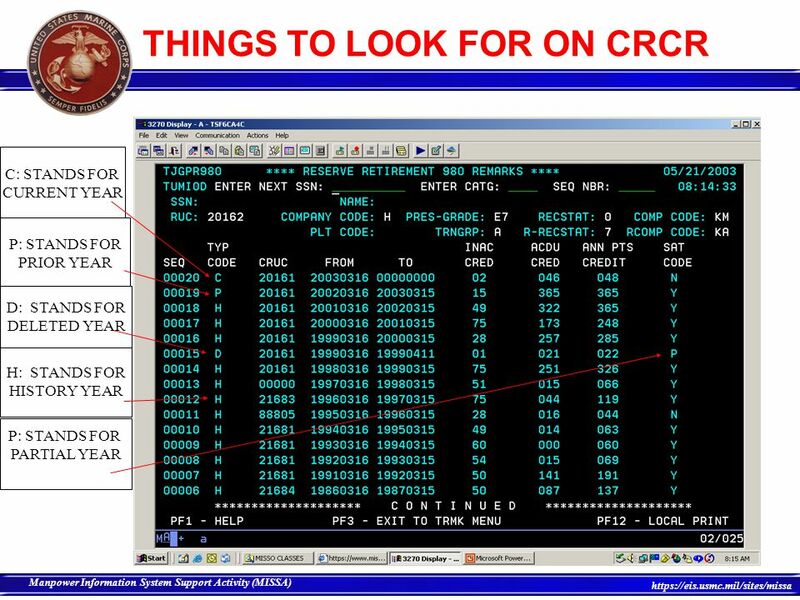 CMC (MMSR-5): verifies ANNIVERSARY date and CRCR changes, and makes any required corrections or contacts MISSO 17 for input. 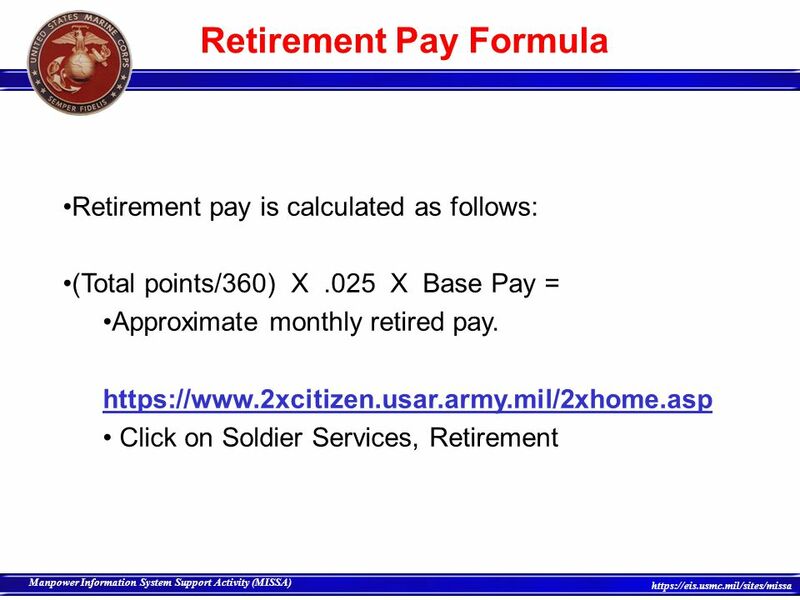 This normally deals with members retiring or have retired. 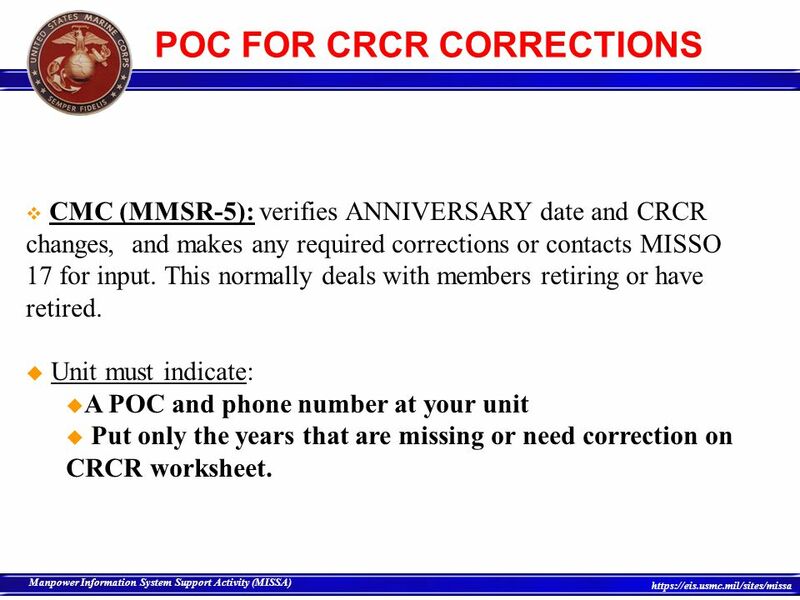 Unit must indicate: A POC and phone number at your unit Put only the years that are missing or need correction on CRCR worksheet. 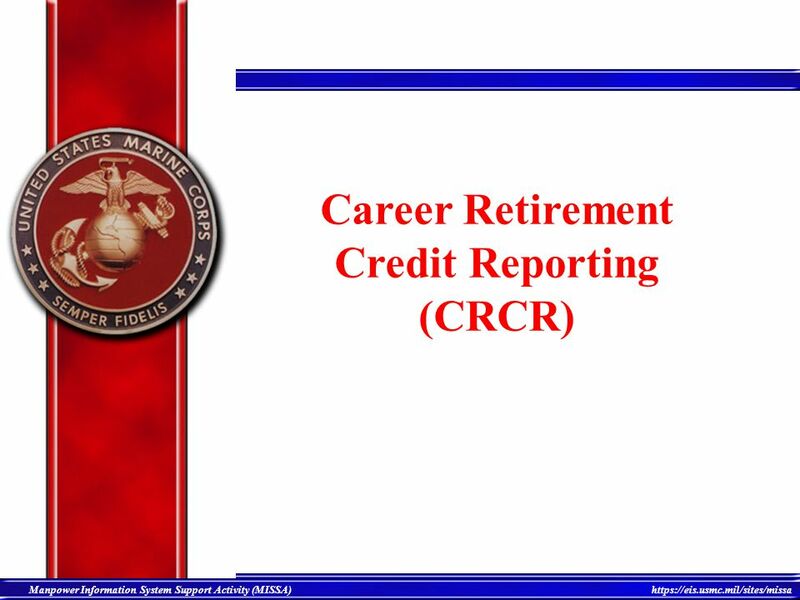 Download ppt "Career Retirement Credit Reporting (CRCR)"
May Welcome and Introductions Training Overview Evolution from CSRS to CEDARS (Fri) Submission and Editing Process (Tues) Course Catalog, Student. A sample problem. The cash in bank account for J. B. Lindsay Co. at May 31 of the current year indicated a balance of $14,691.80 after both the cash receipts.